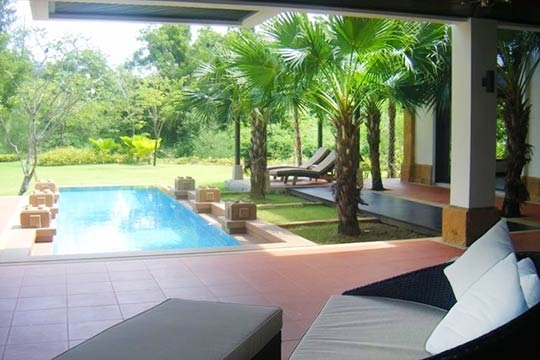 With Bang Tao Beach just a short walk away, 4-bedroomed Villa Samorna is a serene tropical oasis for families or groups. Found in a private estate near Phuket’s best holiday delights, Samorna is ideal for both entertaining and relaxing with its 12m pool, elegant design and expansive outdoor space. 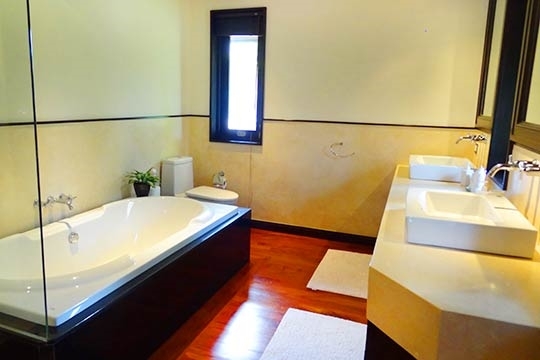 The villa is arranged in an L-shape around the lovely 12m swimming pool and terrace, which has shaded roof cover, an outdoor shower, a table and lounging furniture for alfresco dining and relaxing. 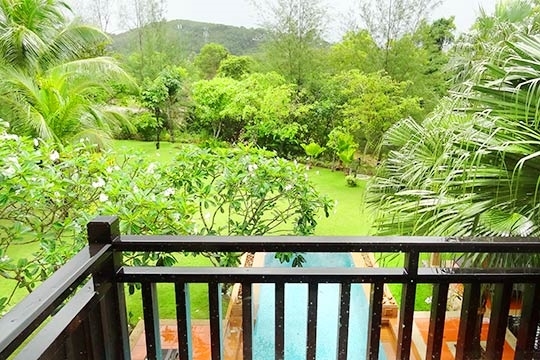 The terrace leads to an ample landscaped garden hugged by a stream that flows to the sea, with the lush surrounding hills in full view from most rooms. 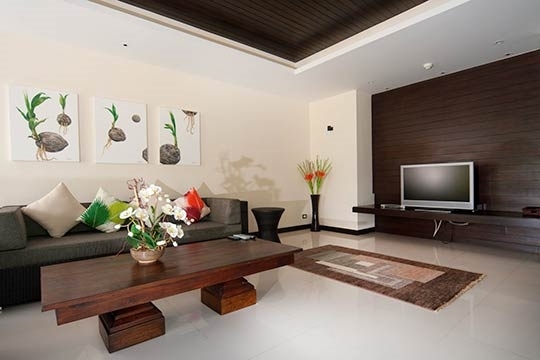 Samorna’s full-time maid takes care of the daily cleaning and regular linen changes, and is available to help arrange other services for guests including in-villa massage, babysitting, taxis, tours and dining reservations. Guests may also hire her to cook meals for an extra charge. The estate’s two large pools are also available to guests. 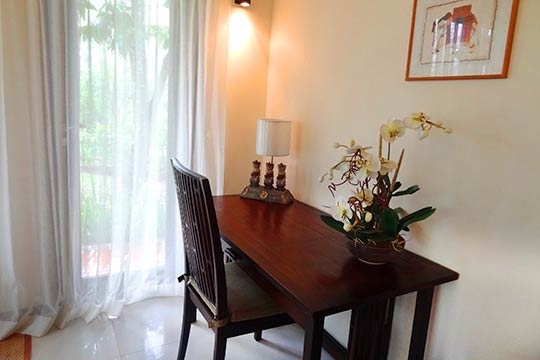 A very-well-cared-for and welcoming oasis near Bang Tao Beach. 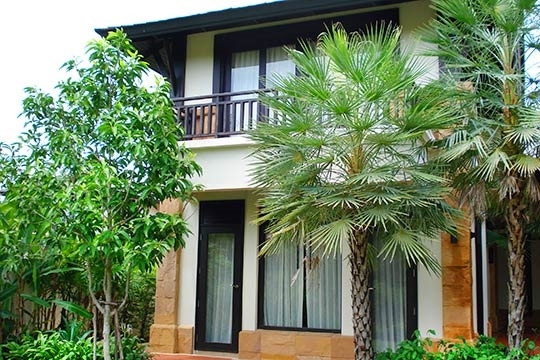 Part of the Chom Tawan estate, Villa Samorna is about 200 metres from the sands of six-kilometre-long Bang Tao Beach. 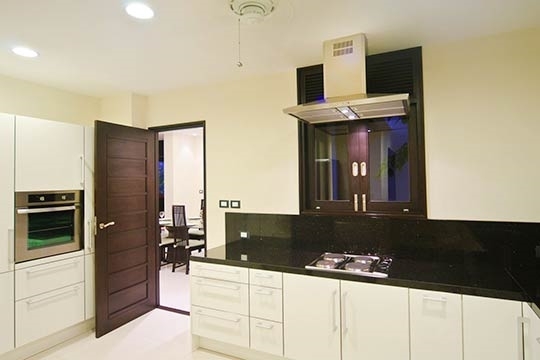 Within the estate is a mix of villas and low-rise apartments, as well as two large swimming pools available for guests’ use. Less than two kilometres to the south, taking up most of the central Bang Tao beachfront, is the family-oriented Laguna Phuket resort complex, where you’ll find the famed Banyan Tree Spa, the 18-hole Laguna Golf Club, several restaurants, a small shopping centre, a medical clinic and a range of leisure facilities including horseback, ATV and elephant riding tours. In the resort’s vicinity are several more cafés, restaurants, shops, spas and leisure services. Also on Bang Tao Beach is the Angsana resort (formerly the Sheraton) offering a family day pass giving access to its posh kids’ club, fitness facilities and large swimming pools. Two upscale beach clubs have found their way to Bang Tao recently, Xana Beach (part of Angsana resort) and Bliss (at Bang Tao’s south end), both competing for the sunset-cocktail trade with creative menus and regular DJ party nights. About two kilometres further north is the peaceful Layan Beach. Taking the narrow road back to the Chom Tawan estate from the Laguna resort you’re treated to groves of tropical trees and glimpses of the inviting white sands of Bang Tao beach. At intervals you’ll spot narrow, well-trod pathways that lead to the beach, with handmade signs beckoning you to turn in and enjoy some seafront dining. Among these small restaurants is the Reggae Bar, just a few hundred metres away from Chom Tawan, which looks just as you might expect it to look: a thatched-roof hut, a shrine to Bob Marley, a couple of surfboards piled up in the corner. We weren’t expecting much from the food here but the menu is surprisingly big and we enjoyed a tasty beef curry. Bang Tao Beach - all six kilometres of it - is one of Phuket’s finest, and without the famous ‘beach roads’ that line other parts of the Phuket coastline, this stretch of paradise remains refreshingly authentic. The northern end, nearest Layan Beach, is comparably untouched, though the opening of Nikki Beach Club there in late 2013 has added some glitz to the sands. 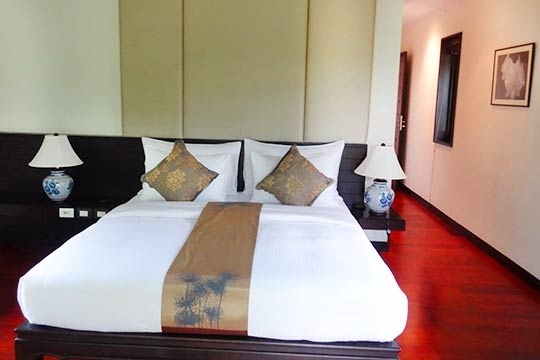 The centre is dominated by the Laguna Phuket Resort complex, home to the Banyan Tree, one of Asia’s most awarded hotels, and six other large resorts. 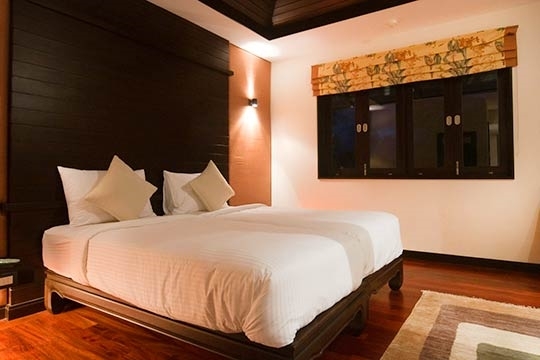 The Laguna Phuket Golf Course, the world renowned Banyan Tree Spa and a host of facilities including 30-plus restaurants and bars at the seven resorts which make up Laguna are all within easy reach (3km). 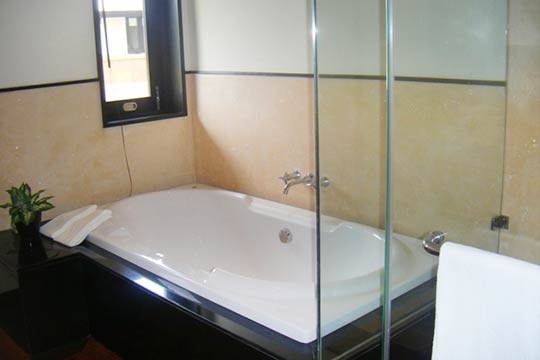 You can find money changing facilities, medical clinics, pharmacies, massage centres and banks in Laguna, convenient western delicatessens for a quick lunch as well as a host of shops keen to attract the resort’s affluent clientele. Just outside the Laguna entrance is the Boat Avenue shopping centre with the high-end Villa Market grocery store and a cafe. Further south, a Tesco supermarket is on the main road between Laguna and Surin. 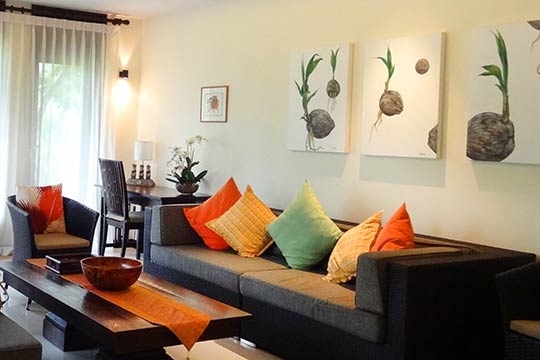 Patong is a 20-minute (25km) drive further south (depending on the season) and offers some of Phuket’s world famous nightlife and ‘knock off’ goods markets. The much larger shopping malls and supermarkets of Central Festival, Tesco and Big C are a 25-minute (27km) drive away on the bypass road. To the north, Layan Beach is a secret well kept by Phuket’s local expat community. Coconuts languish in the sand, cleansed by the crystal clear waters. The beachfront is public but usually deserted, parking is available and, during the high-season, food and drink vendors and beach masseuses allow you to enjoy ‘heaven’ for as long as you like. About a 20-minute (30km) drive to the north is Phuket’s international airport. With a lotus pond and fountain gracing Samorna’s front entrance, the villa’s serenity reveals itself as soon as you arrive. Stepping inside, a bright corridor connects all the shared spaces, with the dining room set in a lovely peak-roofed area to the right, the study at the left, and the living room straight ahead. In the white terrazzo-floored dining room is an elegant table with a glass top resting on large bronze columns. High-backed wooden chairs offer dining for eight. 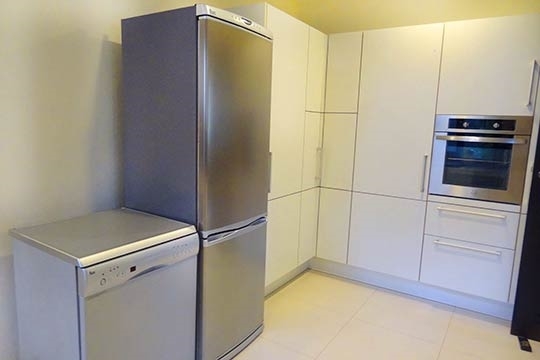 The large adjacent kitchen is equipped with quality appliances, cooking utensils and crockery, with the maid’s quarters and utility room at the back. The study, with folding doors opening onto the terrace, is spacious enough to convert into a single bedroom for those who wish to avoid the stairs to the upper floor. The chic living room has folding doors along two walls that open to the pool terrace and garden. Accented by colourful pillows, a sofa and soft chairs offer an inviting place to relax or watch movies on the flat-screen TV. 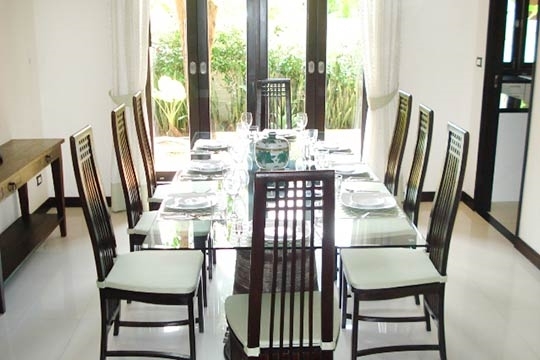 A shaded area on the terrace is furnished with an outdoor dining table for six and two poly-rattan loveseats. 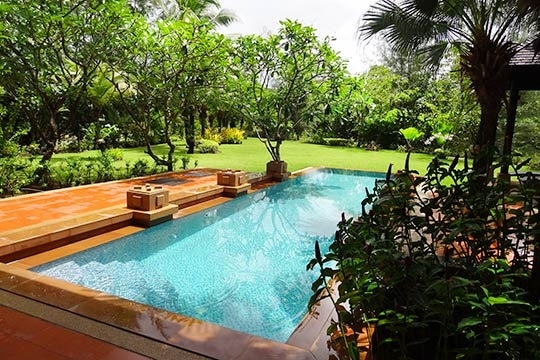 Stretching out from the terrace is the 12m pool and a spacious palm-tree-lined lawn leading to the stream that runs along the back of the property. Samorna’s four bedrooms are all on the upper floor of the villa, in two wings connected by a roof terrace. Staircases on each side lead to a master suite and guest bedroom. The bedrooms towards the rear enjoy great views over the garden and out to the hills. Each master suite features a king-sized bed set under a vaulted wood ceiling, a walk-in wardrobe and balcony, plus en-suite bathroom with a double bathtub and shower. 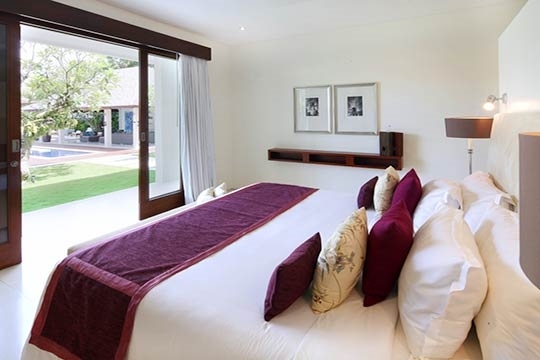 The guest bedrooms have twin beds that may be joined to make kings and en-suite bathrooms with showers. 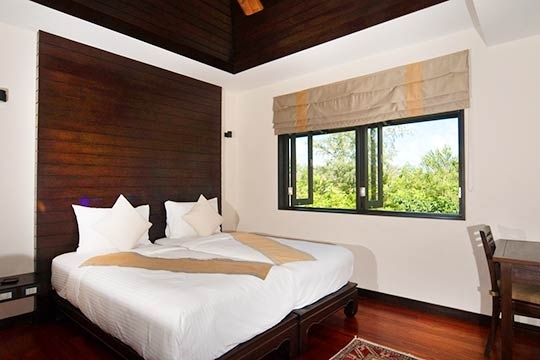 All the bedrooms are warm and welcoming in design with polished wood floors and silk accents in subtle tones. On display and for sale is a gorgeous and eclectic collection of Buddha images, classical Chinese furniture and paintings, terracotta figures and refined Oriental art objects. A hidden gem, Banana Rock Beach (often called Banana Beach) is one of Phuket's last remaining 'undiscovered' west-coast beaches. Located between the five-star Trisara resort and Nai Thon Beach, the only way in by foot is to park at the roadside above and take a pathway down. A fine spot to snorkel or simply relax on the sands. Backed by the Laguna Resort Complex, Bang Tao Beach is a 5km stretch of sand that’s sprinkled with restaurants and sun worshippers. Here you can laze on the beach or take off on a dramatic horseback ride up the sand. Situated to the north of Bang Tao Beach, this stunning stretch of white sand is incredibly serene. Its northernmost stretch is backed by native vegetation and though it's now home to Dream Beach Club it still has a natural feel and rarely gets busy. On the southern end of the beachfront at Bang Tao, Bliss has become known for its fresh Thai and western dishes and regular DJ parties. Enjoy dining in the shade on the large terrace just steps from the pool, or in the club's cool air-con interior. Its VIP dining room hosts monthly gourmet wine and dine events. A chic beachfront restaurant and bar set in the Angsana Laguna resort (formerly the Sheraton) featuring a 35-metre swimming pool, private dining cabanas and a fresh menu featuring tapas, seafood and creative cocktails. Come and admire the sumptuous silks of the iconic Jim Thompson signature store in Canal Village, Laguna. The secrets behind the glorious tastes and aromas of Thai cuisine are revealed in these classes led by the resort's Master Chef. Prepare a four-course meal and enjoy sampling the fruits of your labour at the end of the session. A cluster of shops specialising in antiques, works of art, jewellery, handicrafts, clothing and fine furnishings have been built up along Lagoon Road, better known -- rather inelegantly -- as "the road leading to Laguna Phuket". Among these are Cozy Company, which sells contemporary home decor items and furniture, The Handmade selling high-end stainless steel cutlery, and Silk Wood featuring original works of art and wooden decor products. Novices and experienced golfers will have fun making their way around this 18-hole course, with a good restaurant for refreshments and pizza after the game. Suitable for ages 4 and up. This 72-par 18-hole resort-based golf course boasts a scenic backdrop of steeply rising verdant mountains and panoramic views over the Andaman Sea. Rolling fairways flecked by coconut trees and smoothly moulded bunkers flow nicely and the greens are both large and welcoming with the most challenging two holes saved ‘til last. Enjoy sunset on horseback as you gallop along Bang Tao Beach. Suitable for all abilities, trails take you through grassland, past the golf course and into groves of conifers before finally arriving onto the sandy Bang Tao Beach. 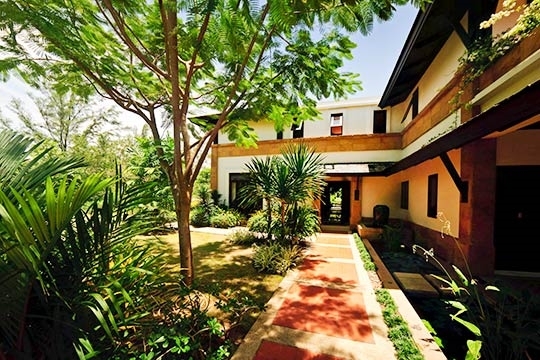 This hotel is well set up for kids since it has a dedicated Kid’s Club offering numerous daily activities, a playground and a meandering swimming pool as well as a water sports centre. This small shopping plaza inside the Laguna resort complex is not the island's liveliest but it is attractively laid out with a good range of boutique shops selling clothing and accessories, handicrafts and souvenirs. In addition to a Jim Thompson silk outlet, there’s a health clinic, minimart, a small children's playground and the pleasant Albatross cafe where you can dine while overlooking the lagoon. Enjoy great-value Thai, French and Italian meals in a casual bamboo-hut setting. The family-friendly Black Cat has long been favourite dining spot for resident expats and visitors seeking to avoid bland, overpriced hotel fare. Close to the gates of Laguna is this contemporary, international restaurant with a relaxed atmosphere and a great wine list. Holidaymakers and local expats alike flock here for its excellent steaks, pizzas and generous desserts. With a menu that innovatively brings together cuisine from around the world, Tatonka offers many unusual and tasty delights. Tapas, sashimi rolls, vegetarian, seafood, pizzas and more, with a good selection of cocktails and wines to wash it all down. Reservations recommended. This chic bakery and cafe just outside the Laguna resort entrance serves delectable pastries, cakes and cookies as well as soups, sandwiches, pasta and sushi. Dine in or ask them to prepare a stylish packed lunch for the beach or your day out on the yacht. This two-level deck-floored restaurant and bar on the hillside above Layan beach offers stunning views of the Bang Tao area plus a great international menu. Come early for sunset. A luxurious menu of delights including massages, scrubs, body conditioners, facials, beauty treatments, yoga and Ayurveda are carried out in Royal Thai salas in a tropical garden setting. The Angsana spa products are divine, or have a look in the lifestyle-orientated gallery to admire indigenous handicrafts from all over the world. The busy Tesco-Lotus supermarket sells fresh produce, seafood, dairy, deli items, canned goods and a small selection of baked goods, plus some wines, beer and spirits (those seeking a better range of wine and baked goods head across the road to Wine Connection). Two bookshops, a Boots pharmacy, fast-food outlets and a small cafe are also found here. Surf and SUP lessons and board rental, surf camps for kids and standup paddle tours by a friendly team. Hosts the annual Thailand SUP Festival each March. This small shop specialises in wine from Australia, California, France, Italy, Spain and South Africa, and also sells quality wine accessory products. A fun place to browse for sleek, shiny things. Discover the fascinating marine life of the Andaman Sea at several sites off Phuket with first-class service. Set on the beachfront of pristine Layan Beach, Dream sizzles day and night with two swimming pools, poolside cabanas and specialty cocktails. Check its events calendar for DJ parties and themed club nights. With its cosy brasserie style interior and creative flair, Dedos has earned rave reviews for its surprising flavours encompassing Mediterranean, Thai, French and Japanese cuisine. 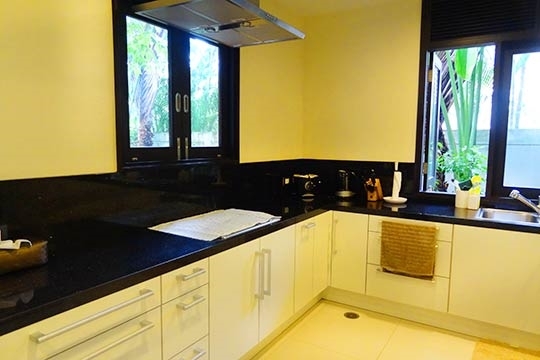 4 bedroom villa located in Bang Tao Beach, Phuket. Ideal for Beach in ten, Body and soul, Bring the relatives, Kid friendly, Going for golf, Fair share for groups, Party pads, Sensible for seniors, Room with a view.